The South Downs Double is a demanding challenge at the best of times, let alone in February. Matthew Jones decided to tackle it though, and wrote about it for us. Wind, mud, hills, are all inevitable when being stupid enough to try and complete a Winter South Downs Double. Setting winter challenges to keep things interesting before the more serious race season starts has become a bit of a habit of mine. Last year it was taking on a couple of monster trail centre days out at Afan and North Wales with riding buddies to keep it socialable. As seems to be the thing to do when setting oneself subsequent challenges is to always up the ante. So what better than REALLY upping the ante and attempting to be the first person to complete a Winter South Downs Double? Funnily enough none of my mates were up for joining me. http://singletrackworld.com/wp-content/themes/singletrack/_inc/images/60pc_black.png); line-height: 17px; position: absolute; top: 0px; left: 0px; color: rgb(255, 255, 255); background-position: initial initial; background-repeat: repeat repeat;">It’s signposted. Should make 200 miles a doddle, right? There is clearly a reason why nobody has completed or indeed even wanted to complete the double in winter. On several recce rides I had planned to test out the terrain and learn the route a bit before the main event I discovered all the reasons. Riding in that neck of the woods in winter is tough going! Those recce rides involved broken bikes, frozen limbs and biblical weather to the point of having to push my bike along the flat in massive headwinds! In all fairness this should have put me off, how could I get through 24 hours of this? Stubbornness came in to play and I eventually set the date to give it a crack at the end of February. Logistics was going to be a big thing in making this thing happen. 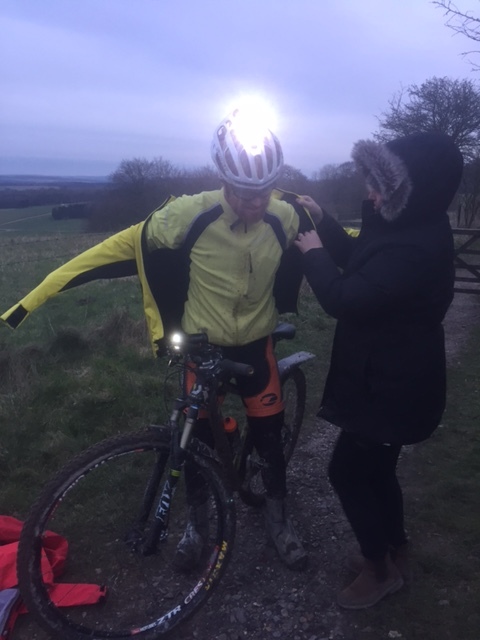 Summer doubles usually involve doing it self supported but in winter I think keeping yourself warm and your bike serviceable would be near impossible, so I pulled out my endurance event trump card: my wife Sarah who as ever (not even that reluctantly) agreed to be no1 support crew. Why on earth she’s willing to do things like follow me round in the dead of night across the south coast I do not know, no bunches of flowers can pay for such dedication! http://singletrackworld.com/wp-content/themes/singletrack/_inc/images/60pc_black.png); line-height: 17px; position: absolute; top: 0px; left: 0px; color: rgb(255, 255, 255); background-position: initial initial; background-repeat: repeat repeat;">Preparation is key. 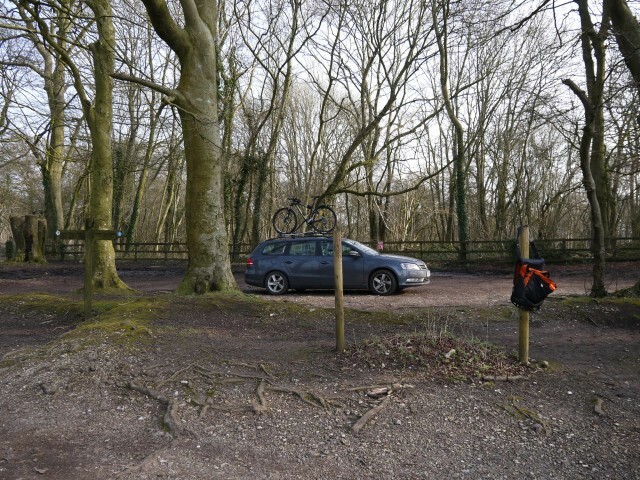 I’m a bit of a stickler for being very organised with all thing biking which usually involves me standing around in the cold waiting for mates who are ALWAYS 10-15mins late. Occasionally I try and be late on purpose but still arrive on time. It does come in handy for planning 24 hour bike rides though. Spreadsheets, support crew briefing notes, sounding out previous completers for advice, you get the idea of the level of preparedness I wanted to have behind me to make this happen. 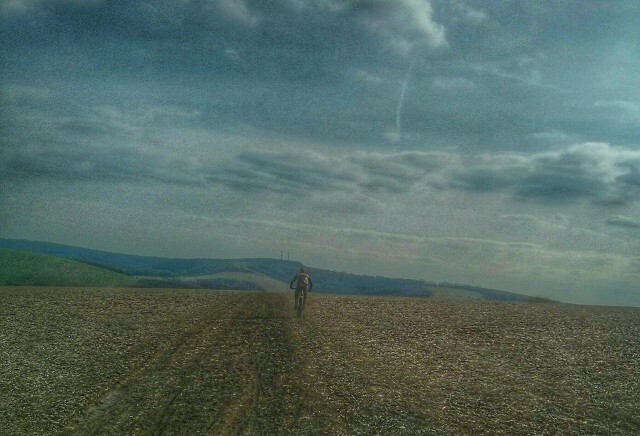 Fortunately having my coach Jon living just by the South Downs was a massive help in both supporting me on training rides down there and on the day itself. These events just don’t happen without the support around you. Solo rides are team sports. On to the ride itself then. The weather forecast had been dry for a few days before so I was hopeful that the bog of previous recce’s might have dried out a bit. The wind was going to be a big factor along with the temperature. A 15mph headwind on the way out was forecast with 25mph gusts to boot. The wind would then shift to a crosswind so I wouldn’t even have it behind for the return leg. 5c during the day and 0c at night, not exactly clement if you throw in the wind chill, brrrrrrr. Fortunately I had a mountain of clothing packed that I could change into, and planned regular meetups meant I could swig some hot tea to keep me from freezing rock solid. http://singletrackworld.com/wp-content/themes/singletrack/_inc/images/60pc_black.png); line-height: 17px; position: absolute; top: 0px; left: 0px; color: rgb(255, 255, 255); background-position: initial initial; background-repeat: repeat repeat;">Sticky field margins were the first of many challenges. I set off and made some good ground straight away before coming to the first real challenge, a long field margin that was a mix of dirt and superglue! After first dragging and then carrying my bike through the clogging slime I then took the lead of a group of bikers in front and hopped the other side of the fence to a more passable field alongside the quagmire path. 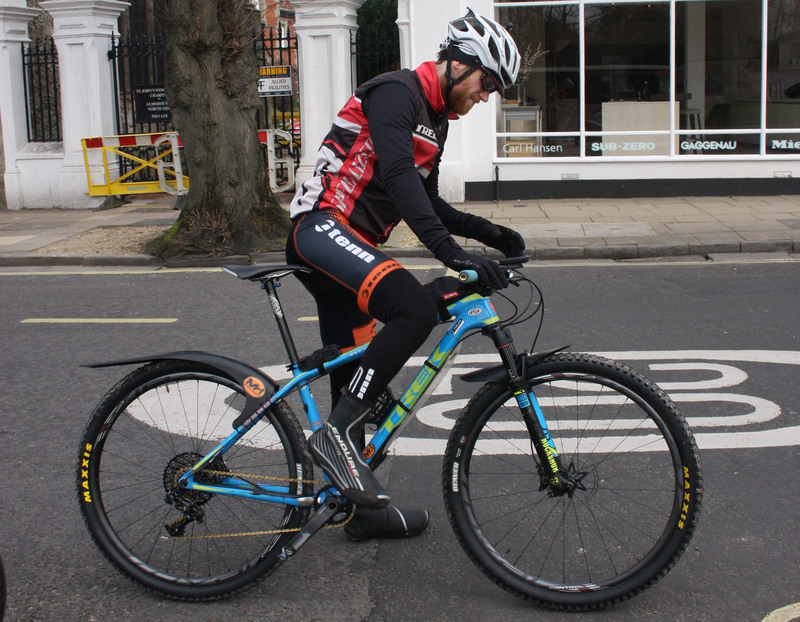 I got going again and had to use my foot to skim off the mud from the sides of the tyres as I freewheeled along. 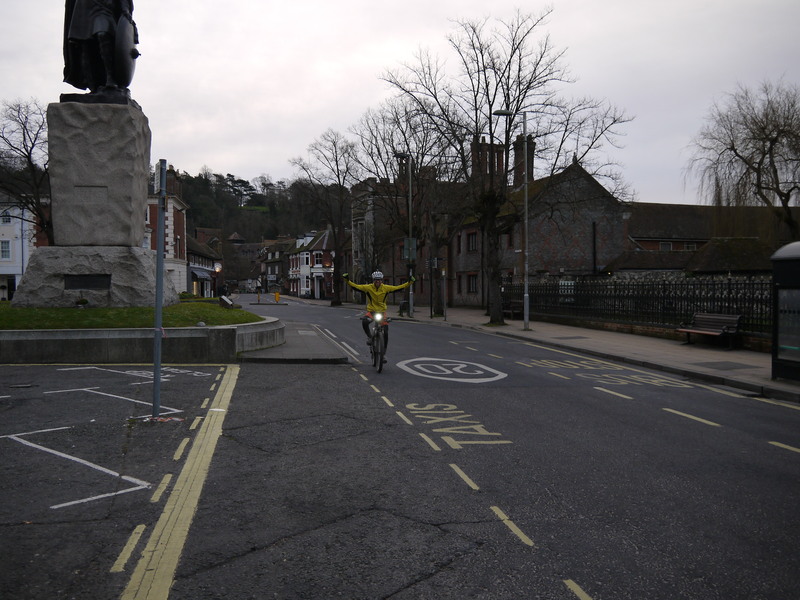 I panicked a bit at this point thinking there was no way my body or bike would stand up to this punishment all the way to Eastbourne and back. 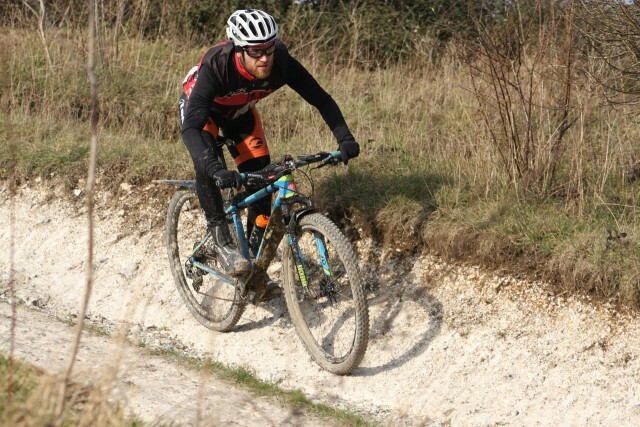 Fortunately the mud (although still making for draggy riding) subsided a bit and I made cracking time all the way to Eastbourne, the time flew by particularly when my buddy Ant joined to ride a section with me. I was running full front and rear mudguards to help keep the crap off me which really helped limit the number of clothing changes required. The worst bit was the headwind which had me crouching over the bars in full aero tuck at some points. The long drag to Truleigh Hill was particularly bad and it seemed to take forever to cover a short distance up there. Heading down grassy fields at 40mph was pretty wild with the gusts frequently sending you sideways off line! As always I planned to nail the downhills to keep my average speed up but this gets a bit more risky in slime and high winds. A few high speed drifts were pretty sketchy but otherwise I survived unscathed. I did suffer a bit of cramp around the hills of Eastbourne as the legs rejected the constant up downs but easing back a bit and focusing on smooth pedalling seemed to help clear it up. http://singletrackworld.com/wp-content/themes/singletrack/_inc/images/60pc_black.png); line-height: 17px; position: absolute; top: 0px; left: 0px; color: rgb(255, 255, 255); background-position: initial initial; background-repeat: repeat repeat;">Gloopy at points, but spirits still high. I circled the signpost at Eastbourne without stopping and went straight back up the long hill out of town at around 7pm. Just over 10 hours to get there was pretty solid going. Things then got a bit more dramatic, slashing a tyre whilst getting carried away on one of the fast rocky descents outside of Eastbourne which involved a fair amount of faffing with getting the sealant to bung up enough to fill the fairly big hole. The spaff in a can I had at the ready came in handy at that point! I called Sarah my wife to see if she could meet any sooner to swap bikes and we arranged a spot a bit sooner than was scheduled, so I lost a load of time sorting all that out. http://singletrackworld.com/wp-content/themes/singletrack/_inc/images/60pc_black.png); line-height: 17px; position: absolute; top: 0px; left: 0px; color: rgb(255, 255, 255); background-position: initial initial; background-repeat: repeat repeat;">Night falls. After getting going again on the spare bike not long after I got a call alerting me to the second slashed tyre of the day, on the support car! Sarah waited for the AA to arrive whilst we tried to figure out if I had enough food and water to keep me going for long enough until she could catch up again. Bonking at this point was a real threat, so I rode on focusing on getting food down me to recharge for the next couple of hours without digging too deep. My clothing choices were spot on so at least I was warm. Wind proof layers were crucial. I felt a lot more vulnerable to the decidedly testing conditions at this point. My coach Jon was fortunately en route to help with the night shift so it was all rather complicated to sort out a rendezvous with gusts making phone calls incoherent, me not wanting to stand still when talking so I didn’t get cold etc. http://singletrackworld.com/wp-content/themes/singletrack/_inc/images/60pc_black.png); line-height: 17px; position: absolute; top: 0px; left: 0px; color: rgb(255, 255, 255); background-position: initial initial; background-repeat: repeat repeat;">The bikes weren’t the only thing to suffer mechanicals. Further disaster struck when the AA tried to fit the spare tyre and it turned out it was the wrong size, thanks VW! An expensive emergency tyre call out later Sarah eventually caught up with me again which was a very welcome sight, although I was expecting to see Jon at a spot 50 yards back at the Truleigh Hill Youth Hostel. I stood outside the YHA looking around, slightly worriedly asking some kids gathered outside if they had seen a man in a van. To me I was making total sense but they looked somewhat confused by a man with a bike, alone at 11.30pm, covered in mud in the dark with what must have seemed like spaceship lights blinding them. I only vaguely remember their unanswered questions of what are you doing, are you ok, stay safe etc. Eventually I found Sarah just round the corner. 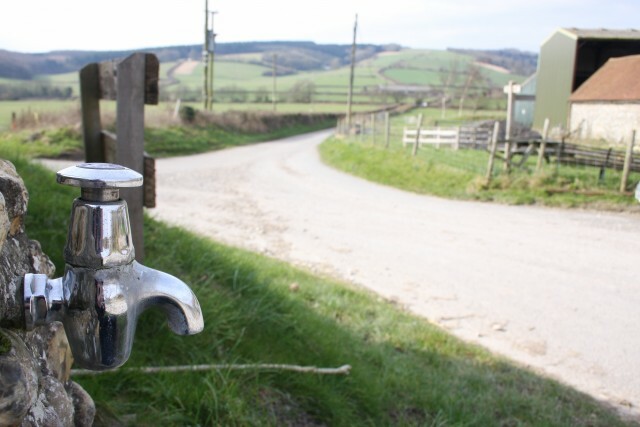 The meetup was much needed, as I’d tried to fill water at one of the taps en route next to Housedean Farm, but it wasn’t working so I plugged on cautiously to the next one. The water from it was ice cold, so drinking it chilled me right through. 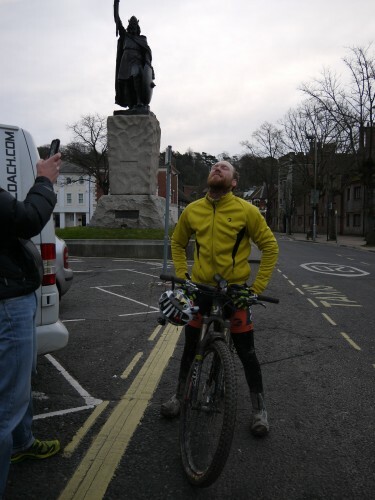 My stomach was on top form though, and I’d been consuming a decent amount of fodder including the endurance riders ‘go to’ fabled warm rice pudding up until that point, so a gel, bar and bottle of water got me through what seemed an age to meet up with the support vehicle again at the YHA. Fortunately the wind at this point had changed direction a bit and wasn’t totally side on, which was heavenly on some of the wide open sections but still rather chilly, so after every pit stop I pushed a bit harder to warm up again (good advice Jon!). 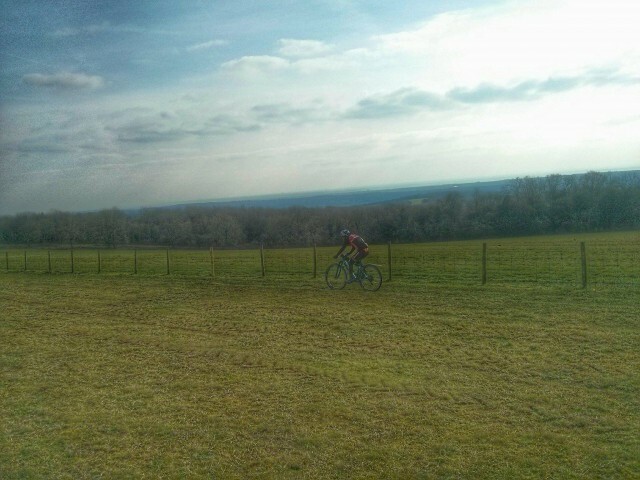 The climbs are pretty massive on the Downs but what goes up must come down. 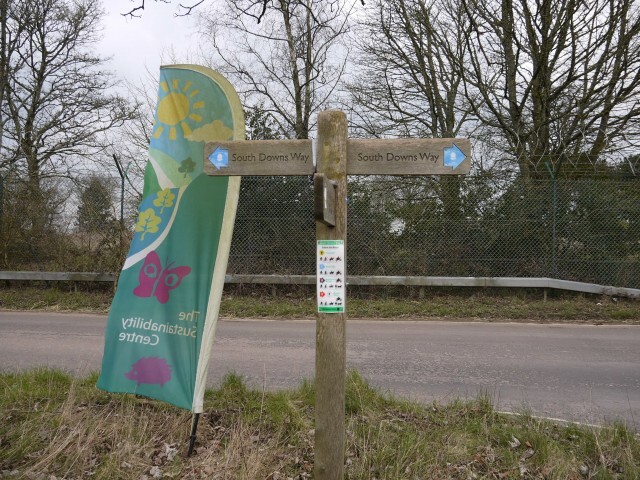 During the day visibility was good for the route signage, but at night the signposts can be trickier to interpret with no one colour scheme and often multiple signs all saying bridleway: easy to get confused by! Fortunately, I had an Exposure piggy back battery attached to my Garmin so could take regular looks down to make sure I was on track. 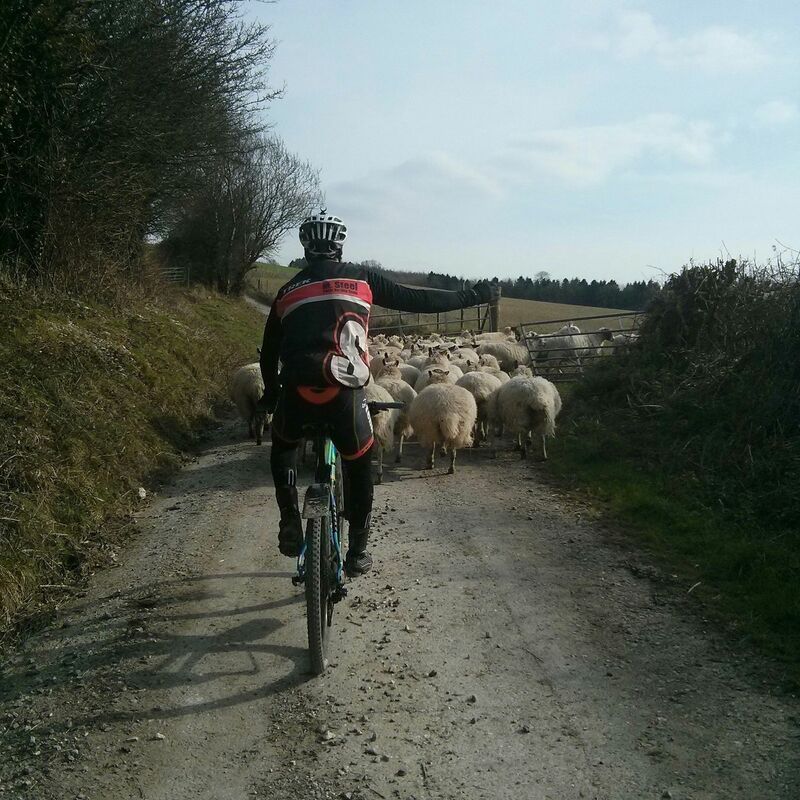 Although doing so in a farm track rut at 25 mph was a bit sketchy! http://singletrackworld.com/wp-content/themes/singletrack/_inc/images/60pc_black.png); line-height: 17px; position: absolute; top: 0px; left: 0px; color: rgb(255, 255, 255); background-position: initial initial; background-repeat: repeat repeat;">… and a lot more difficult without taps en route. The biggest threat in the night was the suicidal wildlife. First rabbits, then bigger foe lay in wait – badgers, foxes, sheep and some other unknown furry things all desperate to end it all with a dash underneath my wheels. After thinking I had got the hang of their cross path movements one little rascal decided to double back for a second bite at the cherry causing a pretty terrifying high speed jack knife. I’m pretty sure that rabbit now has a 2mm shorter tail! Sheep were plentiful although somewhat lesser a challenge to navigate, although to maintain precious speed down the descents I did find myself making Mel Gibson style war cries in the pitch black to clear the path ahead. I probably dazzled or gave heart attacks to quite a few poor little creatures during the night. Pit stops were getting longer as the body started to get colder, with the inevitable shut downs, but the muller rice and occasional soup kept me topped up before hitting the caffeine gels for the last few hours to keep me alert. Apart from the earlier slashed tyre, the bikes were spot on bar a couple of wet lube top ups keep things turning. In a strange way the actual event of these things seems to fly by as the harder work is done during the preparation. 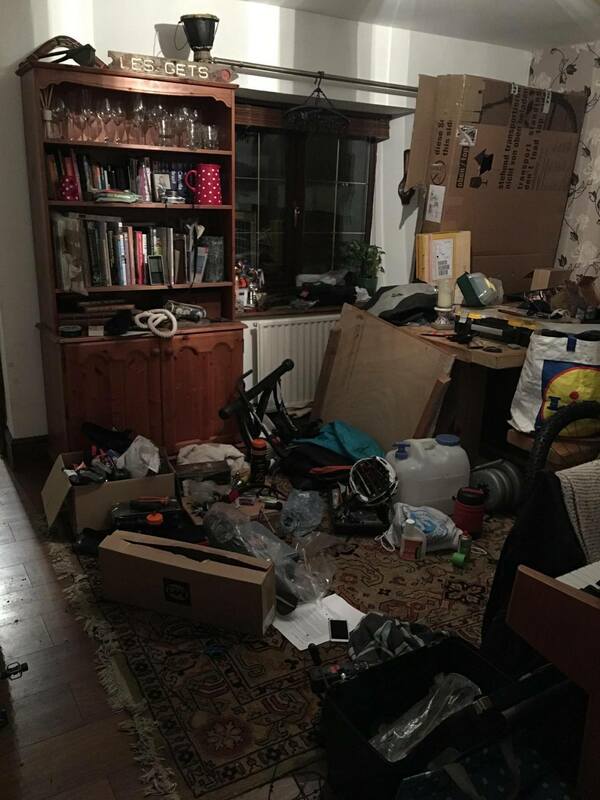 Getting up at 5.30am the day you’re flying up to Scotland for a wedding to sneak an hour on the turbo trainer to ‘offset’ the ‘impact’ of day to day life on race weight is just one example. I don’t think I’m really a natural athlete so have to work fairly hard doing the boring stuff to be able to train for this sort of challenge. The wee hours became at bit of a blur and the miles just kept ticking off. I was getting pretty tired but the realisation came that I wouldn’t take the whole 24 hours to do it so I might actually finish the shift earlier! I only had an hour or so of daylight towards the end of the ride but these sections involved fewer hills so the adrenaline kicked in along with the high of being nearly at the end. A very last quick stop to put on another jacket at the top of the hill and seeing Sarah and Jon one last time was a really nice feeling. Jon as ever with the wise words “it’s not over yet, keep concentrating”. http://singletrackworld.com/wp-content/themes/singletrack/_inc/images/60pc_black.png); line-height: 17px; position: absolute; top: 0px; left: 0px; color: rgb(255, 255, 255); background-position: initial initial; background-repeat: repeat repeat;">Made it! I was down in town what seemed like 2 minutes later, feeling a little sick with relief (if the public toilets were open when I tried to get in I probably would have hurled). Jon and Sarah were there and although Winchester was a bit quiet at 7am, those guys were more than enough welcome party to make the end a happy place. It had taken 22 hours, 10 minutes and 50 seconds. A new winter record but when you’re racing against yourself 1st place is somewhat inevitable. Good luck to any future challengers, wrap up warm and watch out for the sheep!